In A Picture: Ryan's Speech Was Much Ado About Obama : It's All Politics In a picture, the words Rep. Paul Ryan used in accepting the Republican Party's vice presidential nomination show he had a lot to say about President Obama. He wasn't applauding the president's performance. 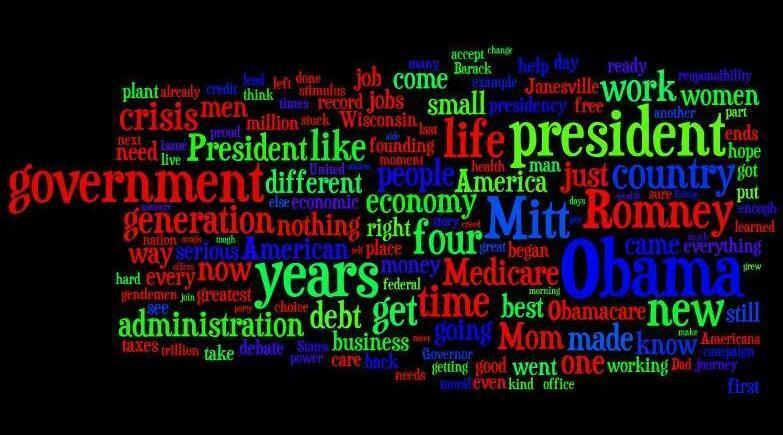 For those who like word clouds, here is Wisconsin Rep. Paul Ryan's speech Wednesday night at the 2012 Republican National Convention in Tampa, during which he accepted his party's vice presidential nomination. -- "Obama." That would be the president, of course, who Ryan said has failed the American people. -- "Mitt" and "Romney." The 2012 Republican presidential nominee, who Ryan said has the experience and ideas to fix the nation's problems. -- "Government." It needs to be less involved in American's lives, Ryan said, not more. -- "Years." He said President Obama has had nearly four years to fix things and hasn't. Ryan, of course, wants Mitt Romney to have at least four years to try things his way. -- "Mom." That's always nice to see. -- The transcript of Ryan's address. -- The live blogging we did Wednesday night.